I’ve been leading outdoor adventures for women for 11 years and this year, I put together one nearest and dearest to my heart of all of them – a “Saddle Up! 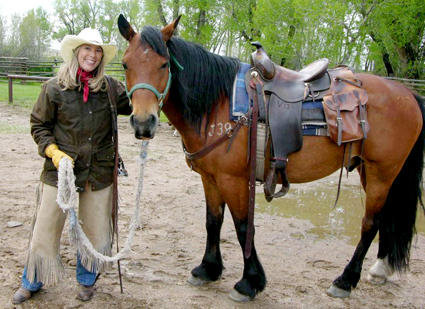 Horseback Writing Retreat” with my friend and expert horsewoman, Sheri Griffith. I called it the “Literature and Landscape of the Horse.” 21 women came to Wyoming from all over the country and for 5 days we read about horses, wrote about horses, and RODE horses. Each woman shared the experience with the same horse for the entire 5 days. All of us had a deep yearning to connect with our love of, and for, horses. Plans for the 2009 “Saddle Up” retreat are well underway. Thank you, American Cowgirl, and I.M. Cowgirl magazine, for keeping the fire burning!